For this 'Ten Years On' post we take a look back at "Splinter". My memory of this film was being warned multiple times to not watch it, this just peaked my curiosity even more and then it became a 'must watch' film for me as I had to know what was so bad about this film, why was I being warned to not watch this film? Luckily for me I took no notice of any of the advice given to me and my curiosity paid off as I ended up watching a film that has stuck with me since then (ten years...), it's a film I regularly visit and is one of those films that I like introducing other people to as well. For a low budget feature it was made so well and there's no bad thing I can point out about it, even now after all this time. It's such great fun to watch, the writing is seriously well thought out and the actors bring the story to life with great effect and believability. If I was Director Toby Wilkins I'd be really proud of myself, for a feature that was made on such a tiny budget it certainly doesn't show, plus the fact that the film is still fondly talked about by those in the know after all this time is a testament to it self. 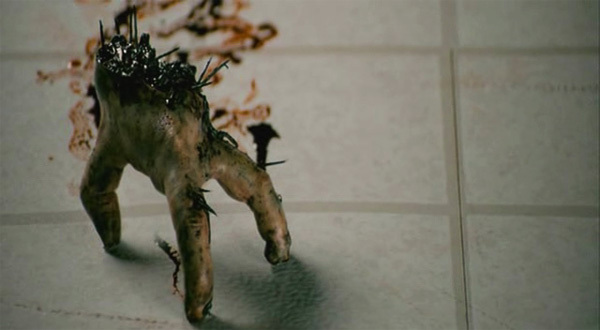 Ten years on and "Splinter" has certainly stood the test of time, it remains a solid low budget Horror feature that could be released now and still be a gem of a film. "FredHeads The Documentary" Needs Your Help! "House Of The Gorgon" Needs Your Help!